Gillian Bradshaw grew up in Washington, Chile, and Michigan. 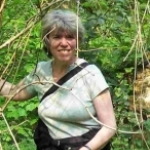 At the University of Michigan she did joint honors in English and Classics, and won the Hopwood Award for Fiction, the Bain-Swigett Prize for poetry in traditional form, and the Phillips Prize for Classical Greek. Then she went to Newnham College, Cambridge, in the UK, to read Classics. She married a physics professor. They live in Coventry and have four children and one grandson. Learn more at Gillian Bradshaw’s website. Down the Long Wind — (1980-1982) Arthurian fantasy. Publisher: On The Path Toward Greatness, Every Hero Makes a Choice. Legends sing of Sir Gawain, one of the most respected warriors of King Arthur’s reign and one of the greatest champions of all time. But this is not that story. This is the story of Gwalchmai, middle son of the beautiful, infinitely evil sorceress Morgawse, and gifted student of her dark magical arts. A story of an uncertain man, doubting his ability to follow his elder brother’s warrior prowess and seeking to find his own identity by bonding with his frightening and powerful mother. Disappointed in himself and despised by his father, Gwalchmai sets out on a journey that will lead him to the brink of darkness… A tale of loss, redemption, and adventure, Hawk of May brings new depth and understanding to Sir Gawain, the legend of King Arthur, and the impact of choices made — and the consequences that follow. I thought I was tired of Arthurian Legend and I’ve avoided reading one for quite a while now, but Gillian Bradshaw’s beautifully written story about Sir Gawain has changed my mind. 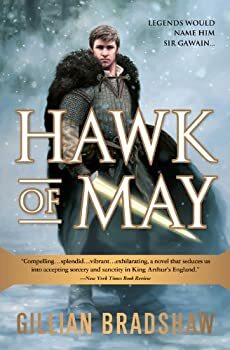 Hawk of May takes place early in Arthur’s career and is inspired by the Welsh legends of King Arthur, the Sidhe, and Cú Chulainn. I’m looking forward to reading the rest of Bradshaw’s DOWN THE LONG WIND trilogy. During his travels, Gwalchmai stays with the family of the farmer who helped him in the last book. Rhys, one of the farmer’s sons, is fascinated by King Arthur and his band of warriors, so he asks Gwalchmai if he can be his servant. Gwalchmai accepts him and takes Rhys to Camelot before they set out again to be King Arthur’s ambassador to King Maelgwn, who Arthur distrusts. 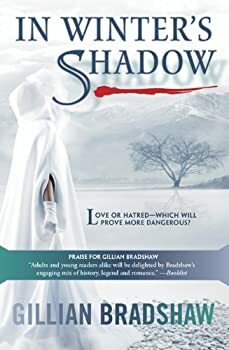 In Winter’s Shadow is the final book in Gillian Bradshaw’s DOWN THE LONG WIND trilogy, an elegantly written historical fantasy about King Arthur that’s inspired by the Welsh legends. While the first two books, Hawk of May and Kingdom of Summer, have focused on Gwalchmai (Sir Gawain), this last novel is written from Gwynhwyfar’s perspective. 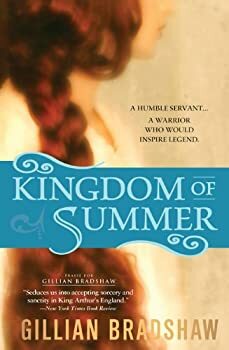 You certainly don’t need to read the previous books to fully appreciate In Winter’s Shadow, but if you’re a fan of the time period or the legends, you’ll probably want to read Hawk of May and Kingdom of Summer at some point. They are lovely historical stories. 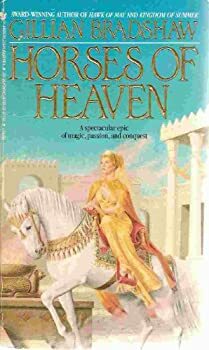 Gillian Bradshaw’s Horses of Heaven is a historical fantasy set in a place and time far from fantasy’s beaten path: central Asia in 140 B.C. It takes place in the kingdom of Ferghana, which was once on the eastern fringe of Alexander’s empire. Now, Alexander is long dead and Ferghana is an uneasy mix of Greeks and native Sakas. The widowed King Mauakes makes a political marriage with a Greco-Bactrian princess, Heliokleia, but he is abusive toward her and their marriage is a disaster from the start. When Heliokleia instead falls in love with Mauakes’ handsome son Itaz, and he with her, the situation becomes as incendiary as Greek fire. The Dragon and the Thief & The Land of Gold — (1991-1992) Ages 9-12. Publisher: In ancient Egypt an unlucky young man meets a wealthy dragon and together they find dangerous but exciting adventure. Magic’s Poison — (2011) Publisher: There was once a terrifying empire based on the magical power of the venom of a race of serpent-men. The empire fell, and the serpent-people are all extinct. Or so the world believed… Marin had never expected to be in the middle of the biggest magical crisis for two centuries. A peasant by birth, she was uncomfortable enough with her noble status as a Guardian, charged with policing the use of magic — even though her district, the White River, was a mere backwater. However, a renegade sorceror in that same backwater district somehow obtained a supply of a notorious magical poison—the venom of a race of serpent-people who’d been believed extinct — and it’s up to Marin to stop him. It obviously won’t be easy: the last people to use that poison ended up ruling the world. Afraid for her life and aware that the governor of her own district has already been bewitched, Marin turns to the duke of the neighbouring province. When the duke’s expedition arrives in the White River, however, the situation becomes ever more complex. The sorceror’s poison-enhanced power is greater than they’d feared; the natives of the region are threatening war; and the king’s son, a bitter rival of the duke, is planning his own descent on the region. The serpent-people turn out to be nothing like what Marin expected, and the struggle over what to do about them has implications she’d never imagined. As if this weren’t enough, Marin realizes that she’s fallen in love with a duke. A simple farmgirl is out of her depth — but then, so is everybody. Beyond the North Wind — (1993) Ages 9-12. Publisher: The Greek god Apollo sends a talented young magician on a quest to stop an evil queen from exterminating a small tribe of griffins. The Wolf Hunt — (2001) Publisher: Love, betrayal, and lycanthropy in the time of the CrusadesThe Wolf Huntis a breathtaking and romantic adventure. When Marie Penthivre of Chalendrey is abducted and taken to Brittanys court, she vows to never dishonor her family by marrying a Breton. There is only one who might change her mind: Tiarnn of Talensac, a handsome and noble knight… and a werewolf. But Tiarnn marries someone elseand when his new wife learns of his secret, she betrays him. When the widow joines forces with Tiarnns enemy, Marie realizes something is dreadfully wrong. Only she is clear-headed enough to rescue Tiarnn and return him to his rightful statusbut can she do so before it is too late?